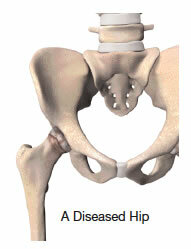 Hip replacement is one of the most important surgical advances of this century. This surgery helps more than 300,000 Americans each year2 to relieve their pain, and get back to enjoying normal, everyday activities. Hip replacement involves the removal of arthritic bone ends and damaged cartilage and replacing them with prosthetic implants that replicate the hip joint. There have been significant advancements in improving the bearing surfaces in total hip replacement. Ceramic-on-ceramic bearings provide superior wear performance.3 Stryker’s ceramic-on-ceramic system has demonstrated significantly lower wear than metal-on-polyethylene systems in the laboratory; therefore, it is anticipated that these improved wear characteristics may extend the life of the implant. 2. Orthopedics.about.com website, Feb. 2006. 3. Taylor. S.K., Serekian, P., Manley, M., “Wear Performance of a Contemporary Alumina: Alumina Bearing Couple under Hip Joint Simulation,” Trans. 44th Ann. Mtg. ORS, 1998. 4. Stryker Test Report RD–04–099.